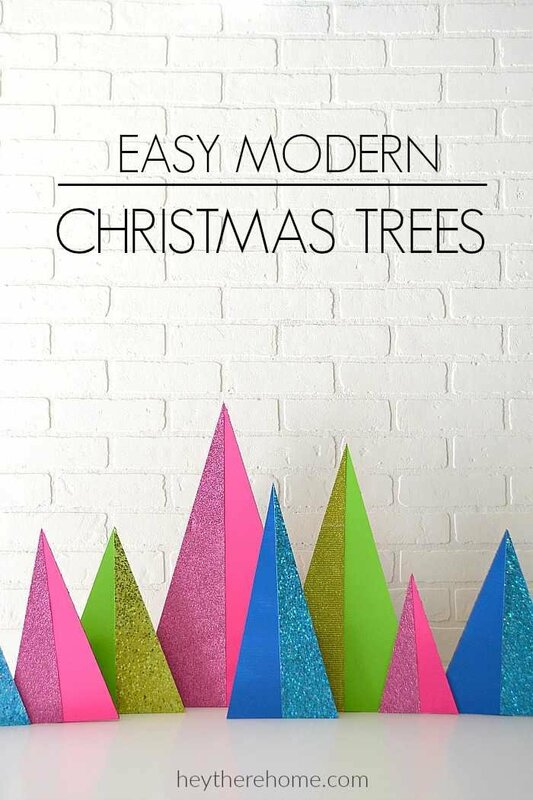 Glittery Modern Christmas Trees - Fun and Easy to Make! Glittery Modern Christmas Trees - Fun and Easy to Make! 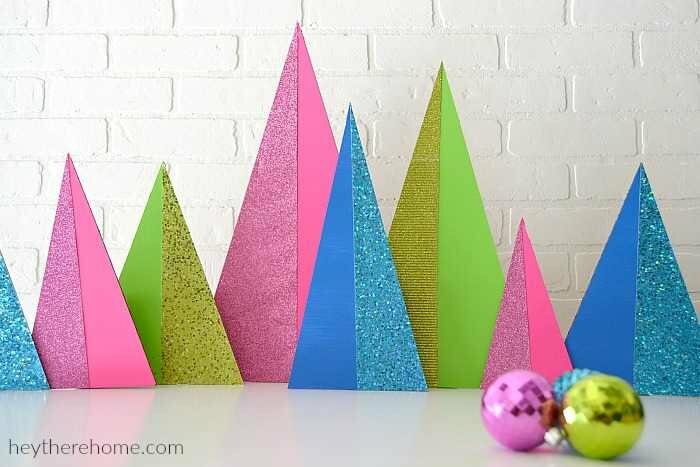 Inside: I love the glitter and fun colors in these Modern DIY Christmas Trees – and it’s so simple to make! Yes I created a huge mess only to realize that I had way overthought this very simple project. But the good news is that I took the long way, only to share the easy way with you, and the result are these really fun and modern Christmas trees! There’s a bit of a story behind this project. And it involves way overthinking this very simple craft. When I first came up with this idea, I envisioned modern, geometric, half glitter, half paint, wooden trees that slid into a little groove on a board so that you could stagger them on your mantel or a shelf, but that would lay flat when it came time to store them away. I went as far as to purchase the wood, cut out some trees, and even bought a new power tool (a router,) to create the grooves for the bottom of the trees to fit in. I would’ve totally and completely failed you with my first method because I try my best to come up with the easiest way to create beautiful things for your home. And that usually doesn’t involve a router. At least not for something as simple as a modern Christmas decoration. But cardboard? Cardboard you can do! So I scrapped my original plan. And as you’ll see, I ended up with the exact idea that was in my head the whole time and got the job done with paper, cardboard, and even managed to figure out how to get these puppies to stand up for free! So don’t run out and buy a router. There’s an easier way. And I learned the hard way for you. White cardboard- I used one of those science project display tri-fold boards. You know the ones we used to have to make ourselves back in the day for school projects. They sell them already made now. You’ll want white so that it is easy to paint. 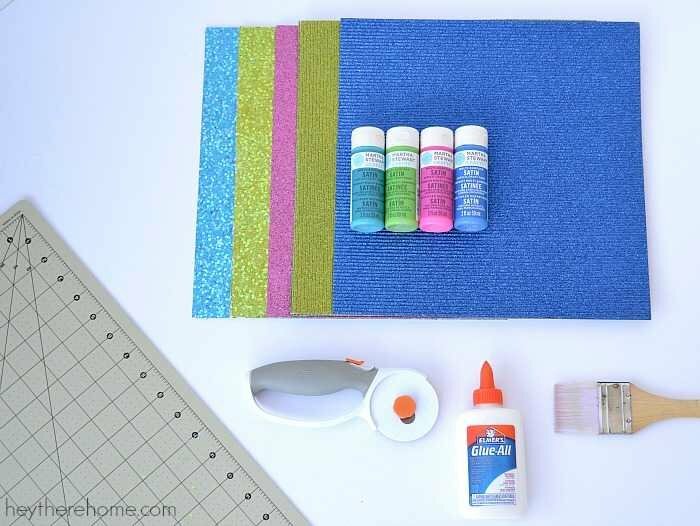 Glitter scrapbook paper– Try to find different textures of glitter. I was able to find the big glitter, fine glitter, and even ribbed paper with glitter. 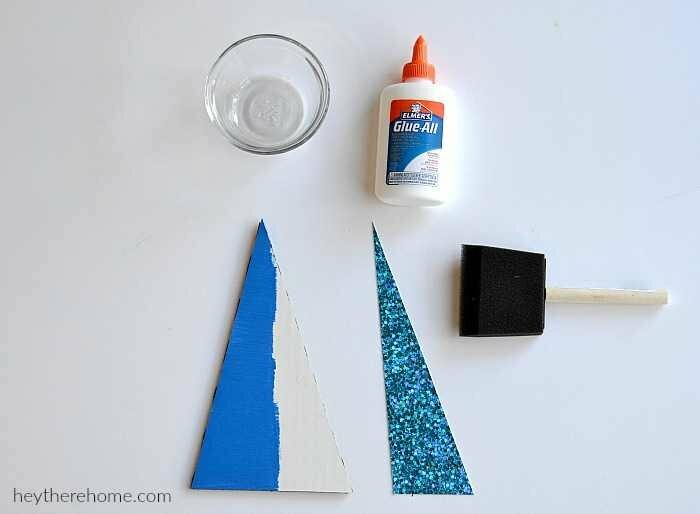 Craft paint to match each color of glitter paper. You may remember this admission over on Instagram. An xacto knife or a rotary cutter– this one is supposed to be for sewing, but I use it for everything. A self healing cutting mat or cutting board. Toilet paper or paper towel rolls. Wrapping paper rolls work well too. Step 1: Plan out the size of your trees. I am going to be displaying these on a shelf in our family room come Christmas time so I took measurements to ensure they would fit. My tallest tree is 20 inches tall. What ever you decide just vary the size of the trees in height and width, but don’t go too narrow. Step 2: Draw your trees and cut them out. 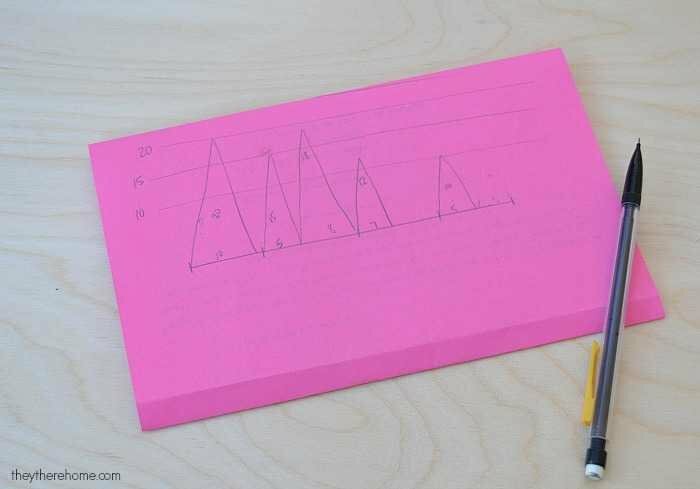 Using a straight edge, draw out your trees (triangles) on the back side of your cardboard. 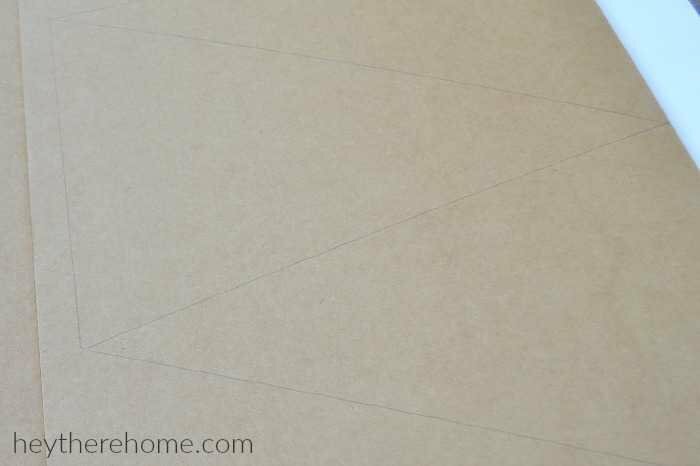 To save time when cutting, use the edges as the edge to the next triangle. 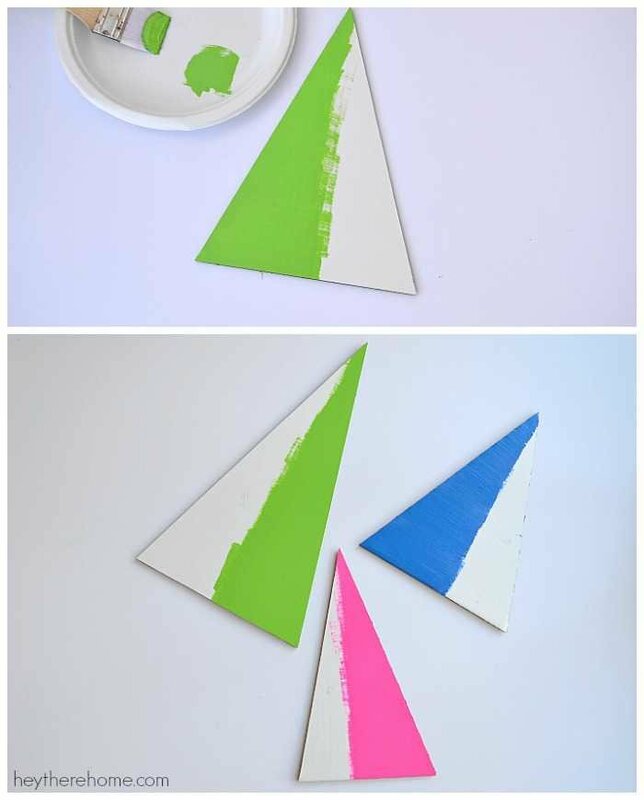 Once you have your triangles cut out, decide which triangle is going to be which color and make a little note on the back of each triangle. Step 3: Cut your glitter paper. 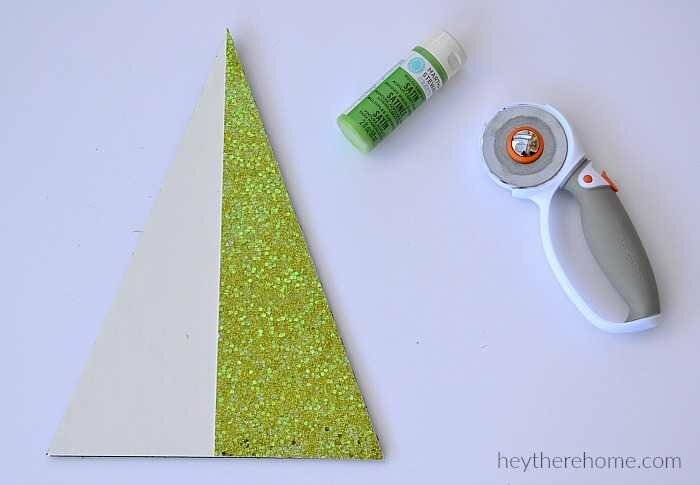 Tip: You may want to number each triangle and then put the same number on the glitter piece that goes with each to make your job easier later. 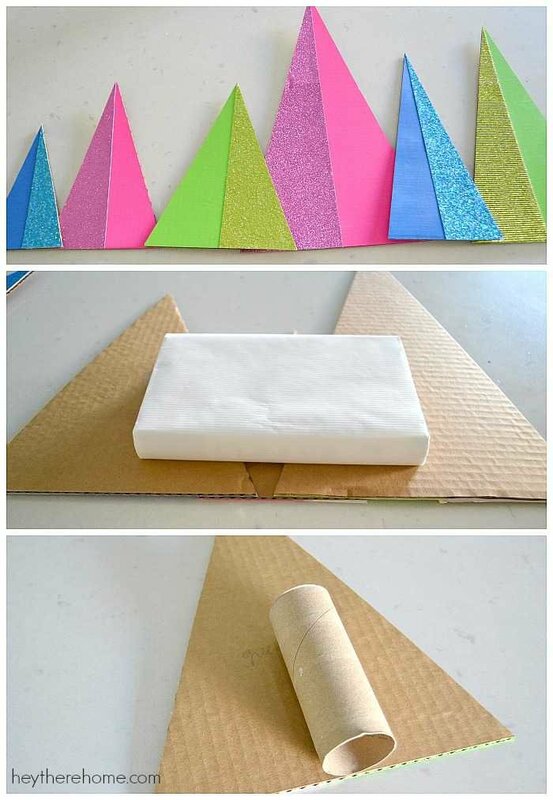 Step 4: Paint half of each triangle in the color of the glitter paper that goes with it. I did 2 coats about 10 min. apart. Step 5: Add the glitter paper. Once your paint is dry it’s time to add the glitter paper to each tree! It’s easiest if you pour a bit of white glue into a small bowl and brush a thin layer of glue on the back side of each glitter piece, making sure to get all the way to the edge. You don’t want to get your glue too thick though. You may want to clip them carefully with binder clips or lay a book on them as they dry. Step 6: Arrange your triangles the way they may be displayed. I grouped a few of mine together and left some as singles. You will want to have some in front of others when they are upright and on display. I ended up gluing a group of 3 and a group of 2 together and left 3 as singles. Step 7: Make them stand up. Glue a toilet paper roll on the back side of each set of trees. Be sure that the bottom edge of your roll lines up with the bottom edge of your tree and is level. I did this by simply putting a bead of glue in a line on my toilet paper roll and placing it on the back side of my tree. The best part is that these are light weight and you could easily fold down the toilet paper rolls to have them pack flat and then bend them back next year- maybe add a paper towel in the center to have them hold their shape. I don’t know about you, but I don’t have a ton of extra space to store all of my holiday decorations so I always try to buy or make decorations that pack nicely. I just love these fun colors and this will go perfectly with the Christmas decorations that we usually do in our family room. These look 3-dimensional in the on-line photo. Are they? Thanks Mary! I’m happy these look 3 dimensional but in reality, they are not. They are flat and it’s the paint and glitter shades that make them look that way! These are wonderful! Such a pretty result for a simple, low-cost project. I made several groupings then placed them across my mantel. I placed tiny white lights in front of them, then hid the lights with snow-flocked greenery. The lights made the glitter super sparkly! My 6 yr.-old granddaughter made her own with minimal help. Love this. Would be a great project to do with my grandchildren. I love these! Great color combo and love the simpler version you came up with. Such a clever idea with the toilet paper roll to stand them up! I understand what you did EXCEPT for the picture that shows something like a white block. What is is it and what are you accomplishing here? Also these look like two of the trees are joined together but you don’t mention that. Could you please clairify? Hi Rebecca. Thanks for the feedback. I do mention grouping a few together by gluing them in step 6. I’ll add in that I placed a heavy book on them while they dried. Have a great day. These are so cute! I love Christmas crafts!